Pictured is Zoe Willdridge showcasing her artwork to Ulster University Vice-Chancellor, Professor Paddy Nixon. Zoe is a past pupil of Belfast Model School for Girls and will be starting Ulster University this semester to study a foundation degree in art. 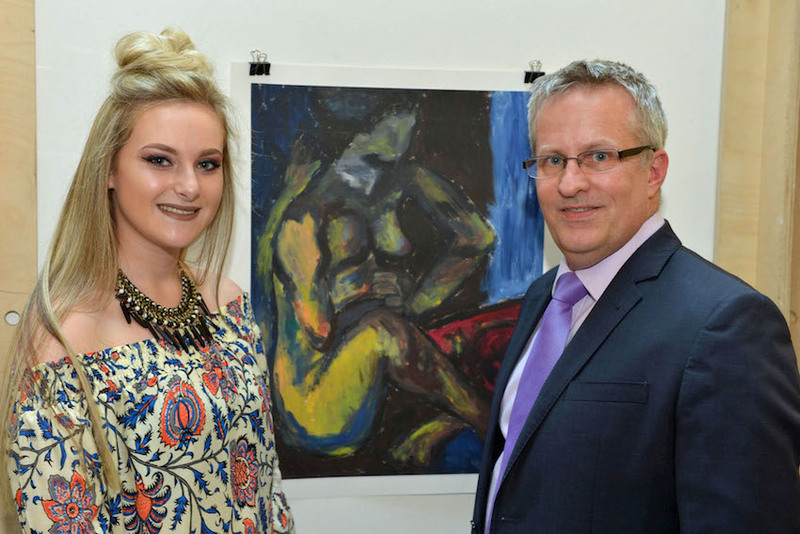 Ulster University has launched a new art exhibition that will showcase creative young talent from schools across North Belfast. The University will celebrate the painting, sculpture and ceramic works of year 13 and 14 pupils from seven schools at the exhibition, which is open to the public until Friday 16 September. The University plays a key role in the local community and the event aims to raise the aspirations of young people to take their education to the next level. Schools taking part in the exhibition at the Belfast campus include Edmund Rice College, Little Flower Girls School, Mercy College, Belfast Royal Academy, Dominican College, St Patrick's College, Cedar Lodge, Hazelwood Integrated College, Belfast Boys' Model School, Belfast Model School for Girls and St. Malachy's College.